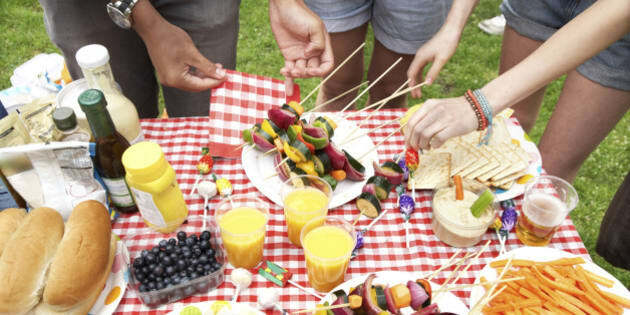 Summer is in full swing, and backyard barbecues, front porch cocktails and beach picnics are taking over your schedule. While it's amazing to enjoy the sunshine, entertaining can be hard work, especially when all you want to do is indulge. Lucky for Ottawa, the capital's full of specialty shops, butchers, and breweries that make hosting a killer party (and supporting local! ), a breeze. Every great barbecue starts with the food, and if you're a meat lover, you need to know about Sasloves. A family-run Ottawa business for 57 years, this place knows their meat. If you're looking for steak, burger patties, or sausages at a great price, you'll want to check this place out. The meat is locally raised, and antibiotic and hormone free. They also have plenty of take away meals, cheeses and other specialty foods in case grilling meat is where your culinary talents end. While they do have a location in the Market, yelpers note this Wellington West location seems to be substantially cheaper. Speaking of floundering in the kitchen, having the right tools makes all the difference. Trust the staff of another long-time Ottawa business (they've been around for close to 95 years! ), to help you find the right tools to smoke the best brisket or blend up a great pitcher of margaritas. They also provide support for their products, so if you have a question or need more instructions, they're happy to help. Need to upgrade your outdoor entertaining scene? The staff at Kitchenalia know their products inside and out, and there's a lot of them packed in this little store. Find beverage dispensers, beer buckets, outdoor dining ware and more. One of the highlights of visiting this Westboro shop is perusing the antique kitchen gadgets on display (many of which are available for purchase). They also offer knife sharpening the first Thursday of every month, so you can be sure those steak knives are ready to go for the weekend. If you're looking for the perfect dessert, dressing, sauce or side, this Gladstone Ave. shop has got you covered. Filled with local goodies like Mrs. McGarrigle's Mustards, Major Craig's Chutneys and Top Shelf Preserves and Pickles, this shop is sure to please any Ottawa foodie. They also stock bison, lamb, and chicken burgers; wild pacific salmon, and a plethora of dips and spreads for veggies and chips. Bonus: If you're short on time they offer a meal delivery service as well. Take a stroll a little further down Gladstone and you'll find yourself in a 100-year-old building that houses a mecca of meat, cocktail fixings and local love. With unbelievably flavourful sausages, 80-day dry-aged steak and half a dozen kinds of salami, this is a grill master's paradise. While the meat is certainly the star of this shop, there's a whole lot more to love. Find all the mixings for a perfectly crafted cocktail like bitters from Ottawa-based Split Tree Cocktails, small batch Walter Caesar Mix, and Fever Tree tonic water. What good is a cocktail mix without the alcohol? Fill up your glass with gin, vodka, whisky or rum from Ottawa's only craft distillery. Located on St. Laurent, you can take a tour of their urban rickhouse and learn about the distilling process, or just grab some bottles from the storefront. Think you can handle your alcohol? Try the White Dog: fresh whisky pulled off the still before it goes into the barrel. At 62.5 per cent, this stuff is not for the faint of heart, but it could make the night a whole lot more interesting! Another specialty shop that houses oodles of Ottawa treats is The Piggy Market in Westboro. As the name suggests, this shop is home to some of the best quality meats in the city, and they stock tons of Ottawa-based companies like Art Is In bread, Pascale's ice cream and Maple Creek Sugar Bush syrup. They are passionate about supporting local producers and farmers and do their best to use seasonal ingredients in everything they make. If you're looking to up your barbecue game, participate in one of their sausage making classes on the last Thursday of every month. Hintonburg's co-op grocery store, café and meeting place is the perfect spot to pick up your groceries for summer entertaining. Find beautiful produce, eggs, meat and cheese from Ottawa farmers, as well as their own line of salad dressings, hummus, and breads. This members-run organization also offers programs like cooking and canning classes, and runs workshops on issues like sustainability and growing your own food. Shopping here means supporting the local economy, and that's a pretty awesome thing. If you've run out of propane or just hate to cook, Thyme and Again has you covered. From fully catered meals, to apps or dessert, you won't have to worry about a thing. Order a local artisan cheese platter piled high with hand crafted cheese from Quebec and Ontario, or try the seafood platter featuring in-house whiskey oak smoked salmon. In addition to their catering services, the food shop also has beautiful baked goods to finish off your meal and you can pick up some Harvey and Vern's soda to wash it all down. What's a backyard bash without the beer? With names like Orange Is The New Pink, Party Animal, and Imperial Super Guy, you just know this beer is going to be different. Micro-brewed in Hintonburg, their beer is available at over 30 bars and restaurants in Ottawa, but you can pick up a growler for your next barbecue for under $10 (plus deposit). Try yelper favourite, Pink Fuzz. This grapefruit wheat beer is perfect for lounging by the pool and soaking up the sunshine.